The «Settings» page will allow you to adjust the settings for this Add-In. The page can be accessed via the «More» menu. 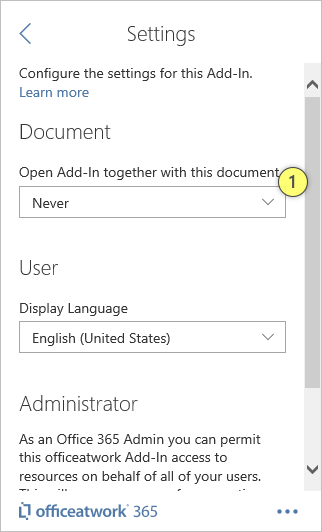 You might want the Add-In to automatically open alongside with a specific document. 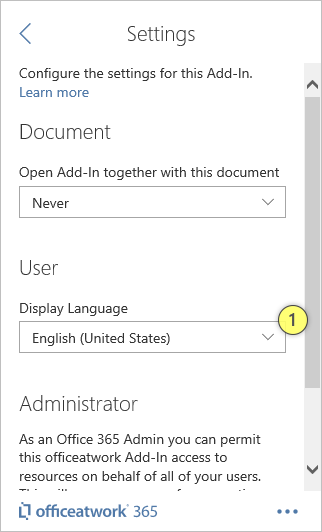 To do that you can use this «Open Add-In together with this document» (1) setting. Choose this option if you do not want the Add-In to open together with your document (default setting). Choose this option if you want the Add-In to only open the next time you open your document, after that it shall not open automatically anymore. Choose this option if you want to have the Add-In open together with your document all the time. Note that the Add-In will also open if you close your document with the Add-In closed and then re-open the document. Please note: If the Add-In is loaded automatically it will always show the 'Design' pane and not the 'Preview' pane. This feature is only available in Word for Windows in version 16.0.8121.1000 and greater. The Language dropdown (1) allows you to decide in which language the user interface should appear. The Automatic option will set your language setting to whatever your Office user interface language is set to. If no matching language is found the Add-In will default to English. If the Language dropdown is set to a specific language, then that language will be used as user interface language for that Add-In. 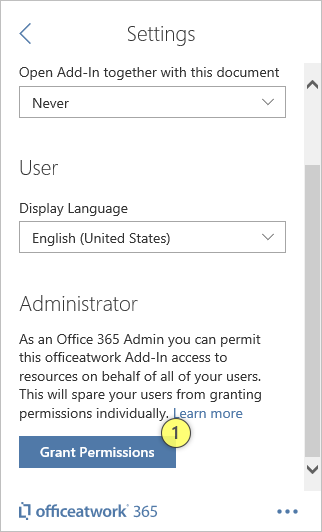 To grant Admin Permissions just click on the «Grant Permissions» button (1) and follow the sign in and grant screens.